After making all that apricot jam, I left the canner out for a few days, hoping it would inspire me to work on those fiddleheads I'd bought. It did; today I pickled them and got three 8-ounce jars of garlic fiddlehead pickles. I followed this recipe but changed one thing, mainly that I used champagne vinegar rather than white wine vinegar. The champagne vinegar is from the batch I made a while back. Also, I'm not sure why it says not to submerge the jars when canning; I did submerge and can them the usual way and they sealed up perfectly. The other things I managed to get done today were to get the "yurt" ready for summer and wrap up the soaps I made last month with my friend. Several years ago I bought one of those backyard tent things that you can put a table and chairs in and then enjoy your dinner without all the mosquitos. 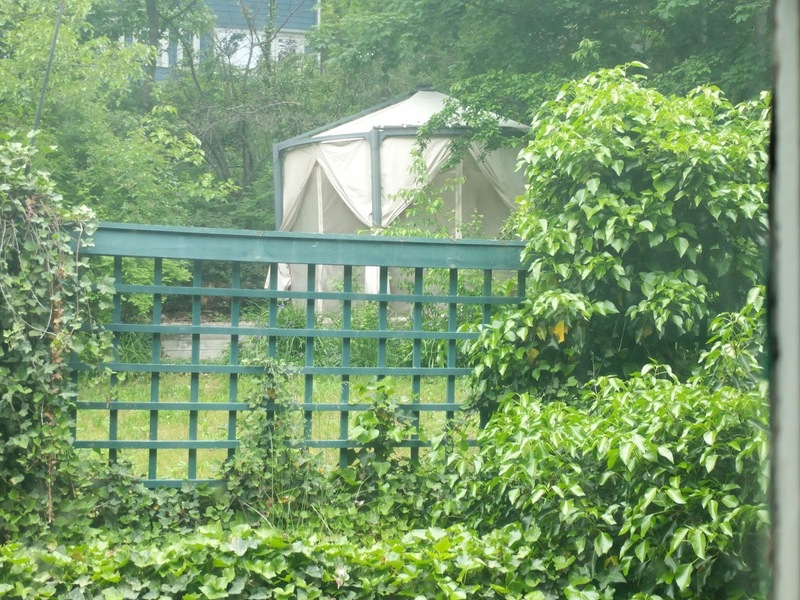 Ours happens to be hexagonal so looks more like a yurt than anything, although I think it's officially a gazebo. Every year we have to hang up the curtains; I made the mistake one year of hanging them up too soon and the stormy spring weather tore off all the velcro straps so I wait now until the weather finally calms down and the pollen surges have passed. My honey-beeswax-lavender-rosemary soaps finally finished curing and I wrapped them in parchment paper with little labels so we can either use them here or give as gifts. Two were already gifted so I only have six left. However, each bar lasts a fairly long time; and I still have other bars of soap from my friend to use here if I decide to give them all away.